Medico Corp Life Insurance Company provides Medicare Supplemental Insurance (Medigap) to individuals that make the state of Wisconsin their home. We feel a Medico Medicare Supplement is a very good choice for your supplemental insurance coverage in Wisconsin. Medico Corp is a subsidiary of American Enterprise Group, Inc. along with other insurers such as American Republican Insurance Company and Medico Life and Health Insurance Company. Medico's stated mission is to enhance the well-being and financial security of the people they serve by providing an array of insurance products including Medico Medicare Supplement and outstanding services that offer choice, independence, and peace of mind. Medico Corp Life Insurance Company currently enjoys an “A-“rating and is considered stable by A.M. Best Rating Services. Medico’s Medicare Supplemental Insurance is approved for eligible residents of Wisconsin and provides very competitive pricing to policyholders. Why Purchase Medicare Supplement Insurance from Medico Corp? Although the federal Medicare plan provides coverage for some hospital and medical costs, it simply does not cover them all. A Medicare supplement insurance plan can help reduce your out-of-pocket expenses for hospital stays, blood, and Part B expenses from doctor visits. Some plans can also assist with skilled nursing facility co-payments and Part B excess charges. Original Medicare will not pay all of your health care expenses. It only provides limited coverage for skilled nursing care and home health care. And even when Medicare does pay, you are going to be required to pay the deductibles and coinsurance percentage. Are you going to be able to afford that? If not, your alternative is an affordable Medicare Supplement Insurance policy that will pick up the slack and fill in the holes left by Medicare Part A and Part B. What Isn’t Covered by Medicare Parts A & B in 2018? Part A: Your Medicare Part A covers inpatient care, such as hospital stays and time in a skilled nursing facility. Most recipients do not pay a monthly premium, but Original Medicare does require significant deductibles and coinsurance that need to be paid out-of-pocket in 2018 if you don’t have the right Medicare Supplement Plan. $1,340 deductible during each 60 day benefit period that must be met before Medicare will cover anything. $335 coinsurance per day of inpatient stay from days 61 - 90. $670 coinsurance per day of inpatient stay after day 90. Once you have exceeded your sixty lifetime reserve days, you must pay all costs. $183 deductible that must be met annually before Medicare will pay anything. 20% coinsurance for covered services, Medicare pays 80%. Excess charges up to 15% extra if your doctor charges more than Medicare’s assigned fee. What Could Your Costs Look Like Without Medigap? Here’s an example to give all those numbers a little more meaning. Let’s look just at Part A services, because that is where the most unexpected of charges can come from. When people talk about the “gaps” in Medicare, these are the sort of numbers they are referring to. Healthcare costs like these are enough to bankrupt a person, so it’s more important than ever to consider what you can do to prevent unpayable medical bills from piling up. Part A Deductible Rider. This is the most important addition to your Medigap plan, and is definitely worth it for the peace of mind. If you take the Part A deductible rider, you won’t have to pay that $1,340 deductible (in 2018), even if you are admitted to a hospital multiple times over several benefit periods. Paying a little extra in monthly premiums is generally worth it to avoid the potential $8,000+ that you could pay annually in Part A deductibles. Part B Excess Charges Rider. Your doctor is allowed to charge up to 15% more than the fee assigned by Medicare for any particular service. If they do, you must cover these costs out of your own pocket. With the excess charges rider, Medico will pick up the tab instead. 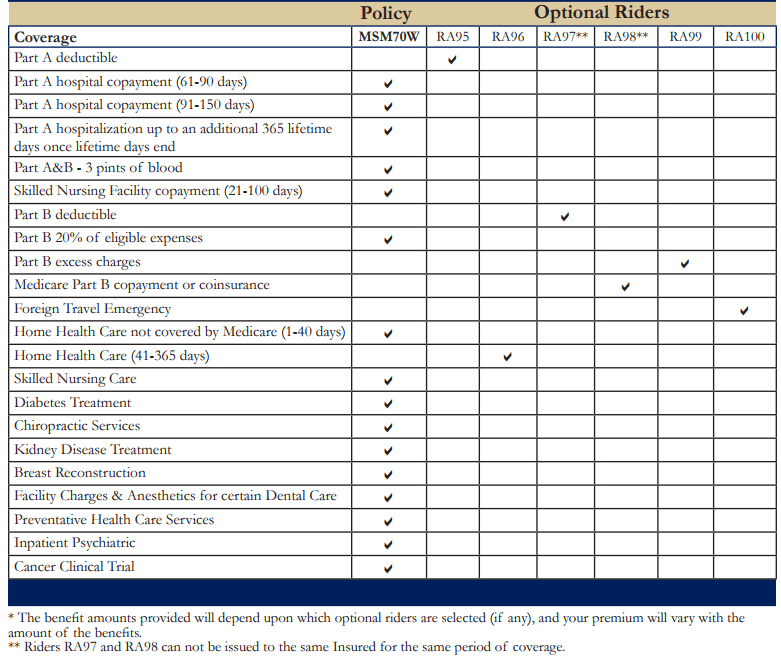 While excess charges aren’t particularly common, this rider can be helpful if you find out that your favored doctor does charge extra or if you plan to travel a lot and don’t want to worry about hidden fees on the road. Wisconsin Additional Home Health Care Rider. This rider covers home health care services for 365 days of the year, extending the basic plan beyond its 40 day maximum. Foreign Travel Emergency Rider. This rider is perfect for cruisers and those who like to see the world. Normally, your Medicare benefits don’t extend beyond U.S. borders. With Medico’s foreign travel rider, Medicare will pay for 80% of covered health care services outside the country once you’ve met a minimal $250 deductible. If you agree with the following statements, it is very likely that you qualify to purchase Medicare Supplement Insurance (Medigap) from Medico Corp.
Are you covered by Medicare now or do you plan to enroll within 60 days of the day you apply for insurance? Are you not enrolled or covered by Medicaid? You do not currently have another Medicare Supplement (Medigap) plan with another company, or, you have another Medicare Supplement plan that will be replaced by this new plan. You will answer “no” to questions 1 – 4 in the General Health section of the application. Previous coverage that you have will not show unsatisfactory claims experience or serious medical issues not covered in the application questions. After you purchase a Medicare Supplement Insurance policy from Medico Corp, you will have 30 days from the day your policy is delivered to review its contents. If you find the policy unsatisfactory, you can return in for a full refund for any reason. Furthermore, if you had a previous supplement plan, you can return to it without additional costs, penalties, or underwriting. This 30 day grace period is known as the “Medicare Supplement free look”. The Medico Medicare Supplement policy does not include any limitations on pre-existing conditions. During your open enrollment period, Medicare supplement providers in Wisconsin cannot ask any medical questions or hold pre-existing conditions against you. If you are changing Medicare Supplement Plans and applying for a Medico Medigap plan you will have to go through the underwriting process. If you meet the underwriting requirements, all pre-existing conditions will be covered. Medico Corp guarantees to renew your policy and any associated riders that were purchased as long as you pay the renewal premium. The renewal premium must be received on or before the due date or during the 31 day grace period. The best time to enroll in Medigap is during your open enrollment period. Your initial enrollment time frame stretches three months on either side of your 65th birthday. Enrolling during this time ensures that you won’t be required to go through a cumbersome medical underwriting process or face higher premiums or limited coverage based on health conditions. You’ll have guaranteed rights to affordable healthcare through Medico. If your enrollment period is approaching (or worse, expiring soon! ), don’t wait another day to talk to a qualified expert about finding the best Medicare supplement plan for you. Delaying might incur severe late enrollment penalties.